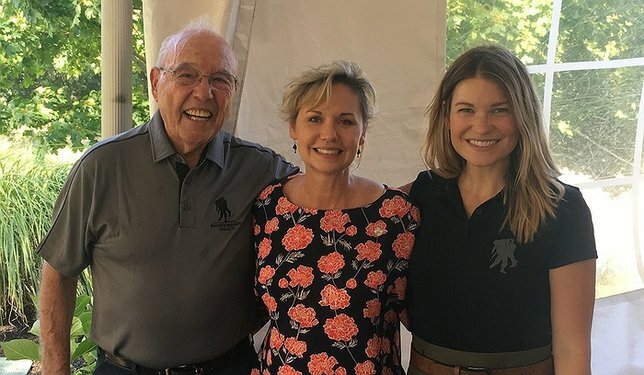 On Thursday, August 9th, Suffolk County Legislator Sarah Anker attended the Birchwood Veteran’s Group 10th Annual Wounded Warrior Golf Outing at Great Rock Golf Club in Wading River. Legislator Sarah Anker with representatives of the Wounded Warrior Project. Wading River, NY - August 15, 2018 - On Thursday, August 9th, Suffolk County Legislator Sarah Anker attended the Birchwood Veteran’s Group 10th Annual Wounded Warrior Golf Outing at Great Rock Golf Club in Wading River. The money raised at this event was donated to the Wounded Warrior Project. Over the past 8 years, the event has raised over $323,000 for this organization. “It was great to meet with the Birchwood Veteran’s Group at their annual golf outing. This event has provided a fantastic opportunity to raise money for the Wounded Warrior Project so that we can provide financial aid to our brave veterans who were wounded in combat. I am incredibly thankful for their dedication to our wounded soldiers and veterans, local and abroad, whose selfless sacrifices have ensured our safety and our nation’s security,” said Legislator Anker. The Birchwood Veteran’s Group is a veterans club for residents of Birchwood at Spring Lake in Middle Island. For more information please visit www.bslinfo.com. Subject: LongIsland.com - Your Name sent you Article details of "Legislator Anker Attends 10th Annual Wounded Warrior Golf Outing"